Super Savings Item! Free Shipping Included! Save 35% on the Gravocore Revolutionary Training Machine | Build Muscle & Burn Fat | Portable & Lightweight | Workout In Less Time | Variable Intensity Routines | Easier On Joints & Back | Digital Workouts Included by Gravocore at Wander Soul. Hurry! Limited time offer. Offer valid only while supplies last. TRANSFORM YOUR BODY IN AS LITTLE AS 5 TO 7 MINUTES PER DAY - Rapidly burn fat and build muscle in less time & with no monthly gym fees. Effective for almost all fitness levels - start immediately with the included research-based workouts or create your own! Strength training, plyometrics, & more are all possible with Gravocore. Easily adjust resistance and intensity of your workout using just your body to get all of the benefits of a gym - in a fraction of the time! ACHIEVE BETTER RESULTS FASTER WITH GROUNDBREAKING DESIGN - Gravocore's innovative harness and wide-set double pulley design substantially reduces core instability and awkward angles. Dramatically adjust the resistance and intensity of your workout in real time without sacrificing complete muscle stimulation to an unstable body. Benefit from a full range of motion and high-intensity exercises, with minimal joint impact. 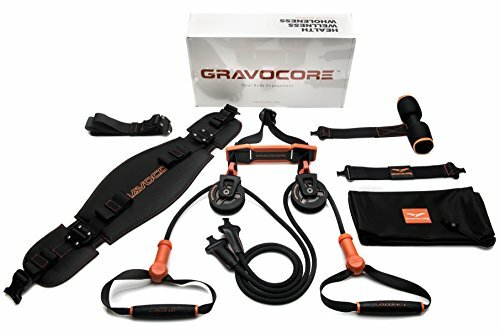 REACH MAXIMUM MUSCLE STIMULATION - With Gravocore you can exercise almost every muscle group with great form & maximum force production whether you're beginner or an advanced athlete with Gravocore's patented harness and double pulley system. LIGHTWEIGHT & PORTABLE: UNLOCK THE BENEFITS OF A FULL GYM ANYTIME, ALMOST ANYWHERE - In less than 60 seconds, Gravocore is set up and ready to use in your home, at the park, or anywhere you find a raised anchor point. At less than 7lbs, Gravocore's design easily travels anywhere with the included compact bag. Effortlessly access and download workouts on your phone to ensure you never miss a workout. UNPARALLELED CRAFTSMANSHIP & QUALITY - Designed to support up to 250lbs, the 10mm climbing rope, industrial webbing, handmade buckles, and state-of-the-art harness and pulley system were perfected after years of testing and research. This one-time purchase guarantees fitness training anytime & virtually anywhere! If you have any questions about this product by Gravocore, contact us by completing and submitting the form below. If you are looking for a specif part number, please include it with your message.